Suggesting disparate weaving traditions from North Africa to South-of-the-Border, Mexican Kilim embodies festive sophistication. 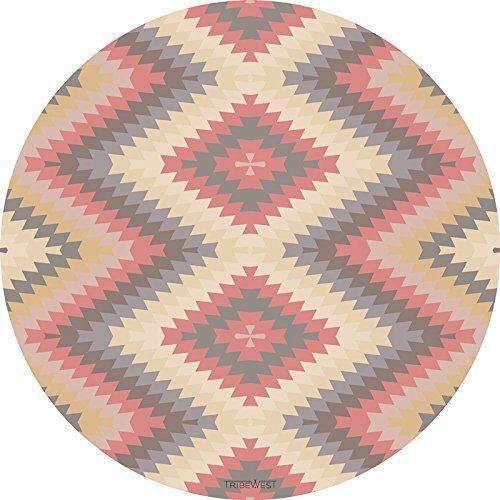 The Mexican Kilim Round mat combines a base of 100% natural rubber with a quick clean polyester top. The Mexican Kilim Round mat measures 49" in diameter and weighs 5.3 pounds, making it both stylish and durable to withstand multiple uses in any room in your home, and for outdoor use. OUR MISSION: Tribe West is a California brand with a mission to make fashion-forward, socially conscious products for the entire family. We create unique designs inspired by enduring and contemporary themes and partner with artisan cooperatives around the world for designs inspired by local and traditional crafts. Our artisan partners earn a percentage of the sales of their designs, and a percentage of Tribe West proceeds supports artisans, women and children in traditional and marginalized communities. CLEANS UP IN A BREEZE with wipe off water and stain resistant & washable color patterns, for non-slip, non-toxic, ultimate, large, portable infant mat. Let your babycare and child discovery time be cushion soft for the bestever sleeping or tumbling. PERFECT FOR FAMILY ACTIVITIES such as carpet kick or tummy time for children, crawl development in the nursery, childrens playspot in lieu of boring foam mats, toddler mommy and me yoga or gym time, baby's early skiphop gymnastics, nap or playpen. SAFE ENOUGH FOR BABIES anti-static, BPA free, plush, padded, nontoxic, tumble ready, fits boys or girls bedroom sets, providing stylish comfort to fit on any rug or flooring, antimicrobial, hypoallergenic. Kids will play, skip, hop, & excercise. BUILT FOR ACTIVE MODERN FUN, this home gear will be there from newborn to 6 month to child's first playroom. Get interactive, use at daycare school for changing protection, playpens, in/out doors, sleep time, sitting, playing or exercise activity. SUPPORT WORKING ARTISANS with sustainable, fairtrade home décor that is eco-friendly. These oversized exercise playmats are a huge pad equivalent in safety to those in big fancy infant workout gyms. Available in classic, geo, chevron and many more designs. If you have any questions about this product by Tribe West, contact us by completing and submitting the form below. If you are looking for a specif part number, please include it with your message.